For this week's doorway I thought I would show Macy's (photo taken about one month ago), since we are in the midst of the "High Holy Holiday Shopping Season." This view is looking up Summer Street, with Chauncy Street on the left and Arch Street on the right. Interesting architecture! I like the little bow-window above the door! I can say that I love Macy's! This picture is so perfect! And what a beautiful sunny day there! Love the architecture in this. It's a very inviting entrance. Are those windows at the top all offices? Nice entrance to macy's. Looks like a nice place to shop. 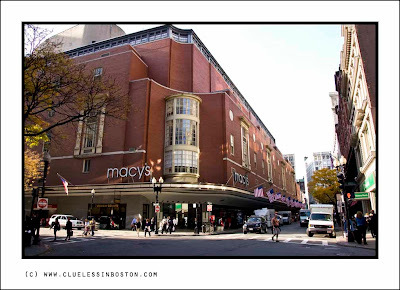 I think Macy's has gotten too big. Unusual building and an inviting doorway. Very nice, Clueless...and you're lucky to still have a Macy's...some of them are shutting their doors here in Florida! Great angle! Everytime I've been down there, I never get a chance to step back and look.